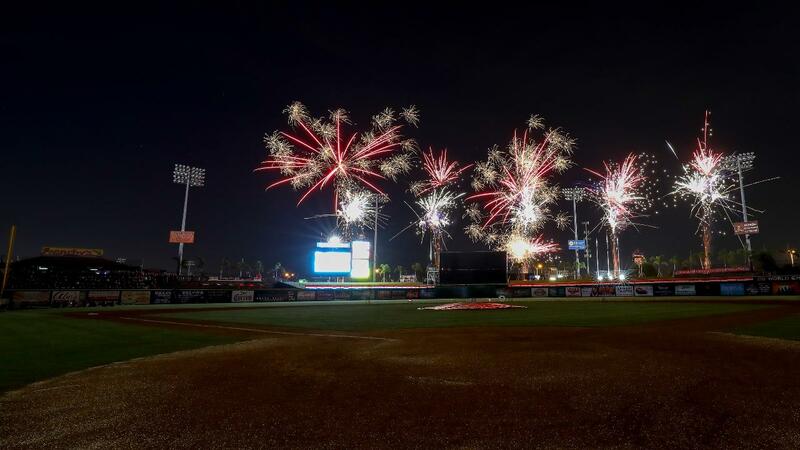 CLEARWATER, Fla. - The Clearwater Threshers 2019 promotional calendar has been announced for the 70 summer home games to be played at Spectrum Field. Featuring the return of weekly favorites like Saturday night fireworks and Dollar Tuesdays by Regions Bank, plus special events like Star Wars Night and Bark at the Ballpark, the calendar is full of fun and family entertainment from April through August. Making its debut last year, The Dog Days of Summer return on a new night - Mondays are now dog-friendly for Threshers games. Bring your pooch to Monday night games and the $6 dog ticket is donated to a local pet charity each week. April 22 is Bark at the Ballpark to benefit the Humane Society of Pinellas. Premium Threshers-themed giveaways are scheduled for many Fridays. Don't miss premium items like the Threshers Cap by Crime Stoppers on April 12, a Fedora Hat on May 3, a Threshers Coors Light Cooler on May 31, a Beach Dogs figurine on July 26 by Kara Lynn's Kitchen, an Aaron Nola bobblehead on August 2, and more. Specialty jerseys will be sported on-field by the Threshers players and field staff and available through charity silent auction at our events Star Wars Night on May 4, Strike Out Cancer Night on May 18, Military & Veterans Appreciation Night on June 1, and Pitch for Pink to benefit the Morton Plant Mease Foundation on July 12. Bring your appetite to Wing Fest on May 13; remember the iconic movie on its 30th anniversary with Field of Dreams Night on May 17; honor local First Responders on June 22; watch the famous Independence Day Celebration Fireworks by Budweiser on July 2 and 3; celebrate Pride Night on July 27; and break out the cape for Heroes for Kids Night on August 3. Opening Night by Regions Bank is April 5, with post-game fireworks and a concert by The Black Honkeys. Season tickets, groups, suites, and individual game tickets are available now at the BayCare Box Office at Spectrum Field or by calling 727-467-4457. Online sales for Threshers tickets will be available on February 1 on ThreshersBaseball.com.